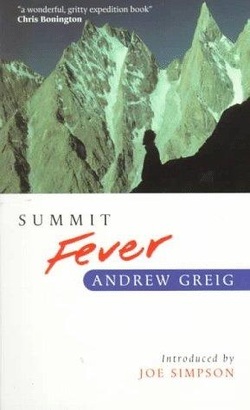 For all Climbers and more importantly non-climbers, Greig's narrative is sublime. Evocative and compelling, a gritty insight into an expedition to the Karakorum, perfect perceptions of the individuals involved and the trials and tribulations of a 3 month epic. Imagine yourself, armchair climber that you invariably are, being invited by a well respected mountaineer to join an expedition to the Karakoram Himalayas to write a book about the experience. What would you do?Well, if you are like Andrew Greig, notwithstanding lack of climbing experience, you find the invitation hard to resist, especially since the mountaineer who invites you, Mal Duff, is personally willing to put you through the paces on some of the local peaks to help you get into the groove of climbing. Before you know it, you find yourself on expedition in the Karakoram Himalayas headed to the Mustagh Tower. This book is the author's account of how he found himself on a high altitude climbing expedition, what he did to train and get in shape for it, what he did when he got there, and what his perceptions were, as a former arm chair climber, of the expedition experience and climbing at high altitude.